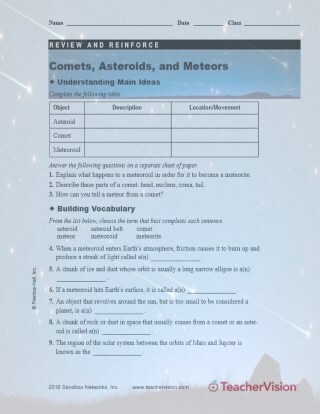 Children use this review sheet to reinforce concepts on comets, asteroids, and meteors. This printable includes a fill-in-the-blanks vocabulary activity, a series of critical-thinking questions, and a description activity. It can be used as an assessment for a unit on the solar system and celestial bodies, or as a take-home activity.